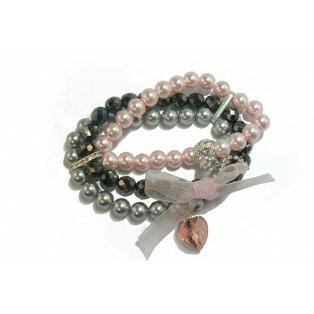 I have made this bracelet using two strands of Swarovski Pearls, one pink and the other grey. I have then centred a strand of black faceted crystals. All three strands are fixed on to beading elastic and threaded through two crystal embeded spacer bars. Finally for a more fashionable and stylish look I have added a blue glass leaf pendant, a crystal encrusted heart pendant plus matching organza ribbon bow.